"....Where Insomnia Hits the Ice"
I'm sorry. Let me try this one last time. Night Six of the NHL Stanley Cup Playoffs saw the Toronto Maple Leafs defeat the....ha. Suffice it to say (and despite what Washington's coach Barry Trotz hilariously tried to say), "David" (the Toronto Maple Leafs) has given Goliath (the President Trophy-winning Washington Capitals) all it can handle and more, and now leads the Best of Seven series, 2-1. Washington seemed to have this game in hand- so much so that I taunted Maple Leafs Homer @SteveBurtch about him playing the saxophone- only to see the Leafs roar back to tie the game before winning it on a Tyler Bozak overtime power-play goal. -the Capitals play in Washington, D.C. 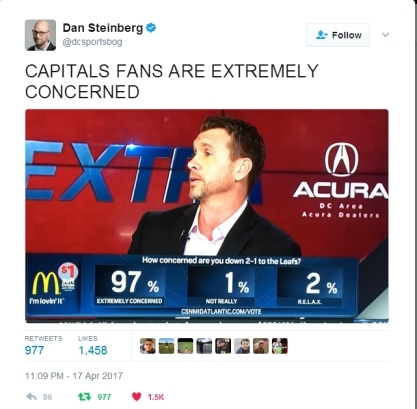 The Capitals' collapse was made all the more delicious by their head coach, Barry Trotz, who tried to stimy the panic by declaring that the #1 seed Capitals (winners of the President's Trophy for the best record in the NHL) vs. the #8 Maple Leafs wasn't "David vs. Goliath:"
In a related story, Barry Trotz failed "Comparisons" in high school. And college. 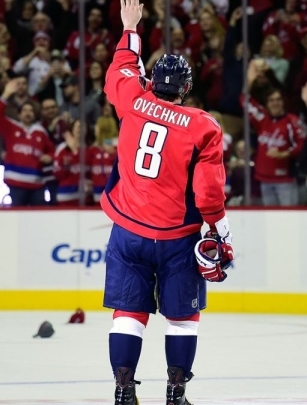 So, yes Pittsburgh, you can still bust out my favorite anagram: "You can't spell OVECHKIN without CHOKE!" because, until "The Great 8" manages to have post-season success, he will forever be known not only as the greatest player to never win the Stanley Cup, but the Greatest Player Who Never Got Out of Round Two. Which is absolutely PERFECT, because in order to get out of round 2, a hockey player has to win...you know...EIGHT GAMES. "The Prosecution rests, Your Honor." 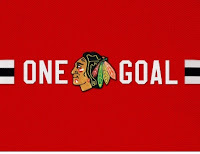 As a result, the upstart Nashville Predators– the #8 seed out of the Western Conference– now have the perennially favored Chicago Blackhawks on the proverbial ropes with a commanding 3-0 series lead. 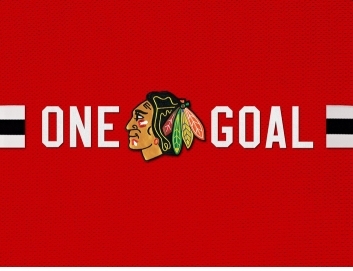 "I'll take 'Awkward Team Mottos' for $800"
There aren't many silver linings for the Blackhawks here: after being shutout for 7 consecutive periods by Pekka Rinne, they took a 2-0 lead, only to see former Washington Capitals draft-pick Filip Forsberg tally goals six minutes apart to even the score. The tied 2-2 score only set up the overtime dramatics, where Kevin Fiala was allowed to skate through the crease and bury a backhand past a sprawled and vulnerable Corey Crawford (who otherwise stopped 46 of 49 shots). The Senators versus Bruins series has lacked the attention of luster from every market not ending in -TTAWA and -OSTON, but the narratives coming out these games has been fantastic. In Game 1, the Senators' Twitter PR team mocked the Bruins' darling analytics, only to see it all come undone. In Game 3, the Senators leapt ahead to a 3-0 lead behind a pair of goals from Mike Hoffman, only to see Boston roar back with 3 goals in under 7 minutes (we're looking at you, Noel Acciari, David Backes, and David Pastrnack) in the second period, leading to a wide open yet scoreless third. In overtime, Riley Nash was went out for roughing Bobby Ryan following what sure looked like a coincidental series of penalties; however, only Boston was sent to the box, and in the ultimate act of cruel fate, it was the non-penalized Bobby Ryan to score via deflection to give Ottawa the 2-1 series lead. The Calgary Flames entered the playoffs as one of the hottest teams (pun only partially intended) in the NHL, and were viewed as a threat to any team seeded to face them. The Flames were young, but they had some high-end skill talent in Johnny Gaudreau and Sean Monahan, along with Mark Giordano and Doughie Hamilton. Instead, the Flames' potent attack has been relatively kept in check by a now-healthy John Gibson, whose play has propelled the Anaheim Mighty Ducks to the precipice of moving onto round 2 with three consecutive wins in net. Granted, Game 4 required a bit more of magic as Anaheim fell behind 4-1 to the upstart Flames (due in large part to the 6 penalties the Ducks took to the Flames' one), but Shea Theodore both started and finished the comeback, scoring twice to even things at 4. Corey Perry (yes, him) then ended things a mere two minutes into overtime to give the Anaheim Mighty Ducks the commanding 3-0 series lead. The Penguins look forward to their FLAWLESS VICTORY against the reeling Columbus Blue Jackets tomorrow morning, while the Canadians and Rangers will resume their goaltending showdown. As always, feel free to comment with questions, ideas, recipes in the comments section!